The parents of a deceased teen are carrying on his legacy to see his dying wish of ending abortion come true. 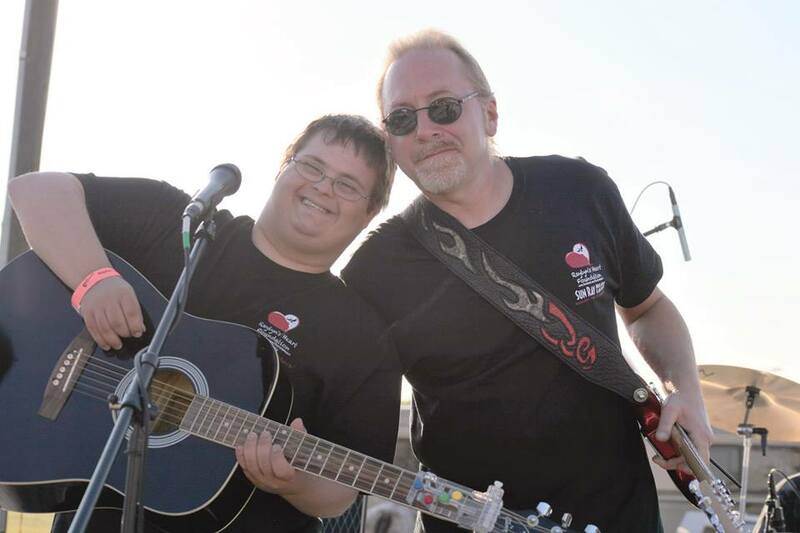 On August 26, 2018, Rusty and Kendra Thomas lost their beloved son Jeremiah Thomas at the age of sixteen, after his body succumbed to cancer. This amazing young man spent his final days and hours on this earth pleading for the lives of the unborn. As a result of Jeremiah’s dying wish, the Governor of his home state of Texas, where the Roe v. Wade court case on abortion originated, made a promise to Jeremiah, “to outlaw abortion altogether in the State of Texas,” which has yet to come true. Jeremiah’s passion for protecting babies whose lives were targeted for violent death due to the legalization of abortion grew in the months preceding his diagnosis. But, after Jeremiah learned that his own days were numbered, he doubled down on his fight to see abortion abolished and innocent lives protected. His wish came true and on June 17, 2018 Jeremiah and the Texas Governor spoke. For that “wish” Jeremiah was bullied online, but, he was not deterred. In fact, his response was to forgive. After Governor Abbott made his promise, videos of it went viral, gaining coverage by Fox News, the Daily Signal, Live Action, and many others. But, tragically Jeremiah died just two months later, never seeing his wish come true. Now, his family has taken up the banner. “This is not something Jeremiah saw in his lifetime, this is something we can do in our lifetime,” his father Rusty Thomas stated. The legislative session in which Governor Abbott promised Jeremiah he would be pursuing to outlaw abortion altogether in Texas began January 8, 2019. So, at the request of Jeremiah’s parents, an online petition to invite others to join Jeremiah’s wish by urging Governor Abbott to keep his promise by making abolishing abortion an emergency item for the State legislature, has been hosted by Abolish Abortion Texas. The family has requested that in addition to signing the Jeremiah’s Wish petition, supporters make a short video encouraging Governor Abbott of Texas keep his promise to Jeremiah and post it on social media inviting others to do the same. Blake Pyron, who lives in the small North Texas town of Sanger, has become the state’s first businessman with Down syndrome. 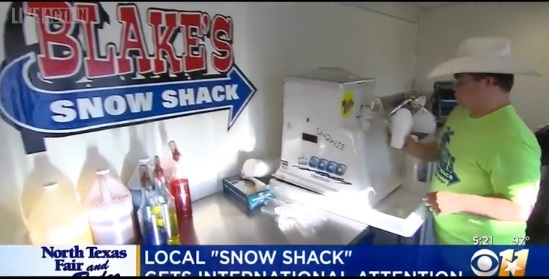 Live Action recently sent a film crew to Denton County, Texas, to meet Blake, who, with the encouragement of his amazing family and supportive community, started Blake’s Snow Shack at the young age of 20. Blake’s mother, Mary Ann, told Live Action News that she always wanted to be a mother. She has two sons: Mitchell, and his younger brother Blake, who was born with Down syndrome. 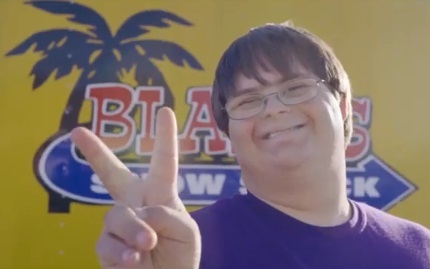 Blake became the youngest person in his city to own a business and he also became the first business owner with Down syndrome in his hometown of Sanger (and possibly all of Texas). As a result, Blake’s business has been recognized by Texas Governor Greg Abbott as well as other dignitaries, and Blake has been featured on many media outlets both nationally and internationally. Blake’s Snow Shack has also received a NASCAR endorsement. Live Action News spoke with Mary Ann about how the community has embraced Blake. “Early on, I thought that it would be harder for Blake to make friends than his brother Mitchell,” she said. But that wasn’t the case. Blake is extremely outgoing and has become quite a legend in his community. “Once people people get to know him, they find it easy to like him. He has a lot of friends,” she stated. One of Blake’s oldest and best friends is the son of Jennifer Watts, a long time friend of the family. Jennifer told Live Action News how her son Brance, who is currently playing football at Emporia State University in Kansas, became good friends with Blake. Jennifer said that the concept behind “Blake’s helper” was inclusion, and if Blake needed help, Brance would be a peer helper for him. “Whenever Blake and Brance were in High School, Blake was part of their football team. He started out as a water boy and would run out through the sign. Their senior year, Blake was made an honorary team captain, ” Jennifer recalled. Pastor Mann pointed to Blake’s family and praised the way Blake’s parents always encouraged him to do what he wanted to do. Our family served the community and that included Blake. Because of that, we have had families tell us that their children are better people for having Blake as a friend. Family dynamic has also helped. His big brother Mitchell has been his biggest fan since day one. 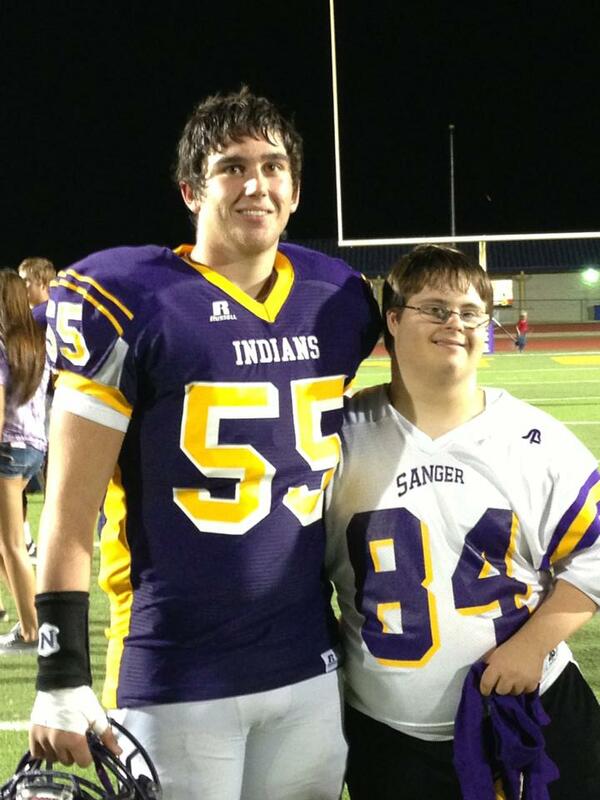 Blake wanted to play football just like his big brother Mitchell, so Sanger High School and his coach made him the manager. He would run out with the flag in support of the team. Blake’s football coach, Chuck Galbreath, was part of the community support for Blake and others with disabilities. 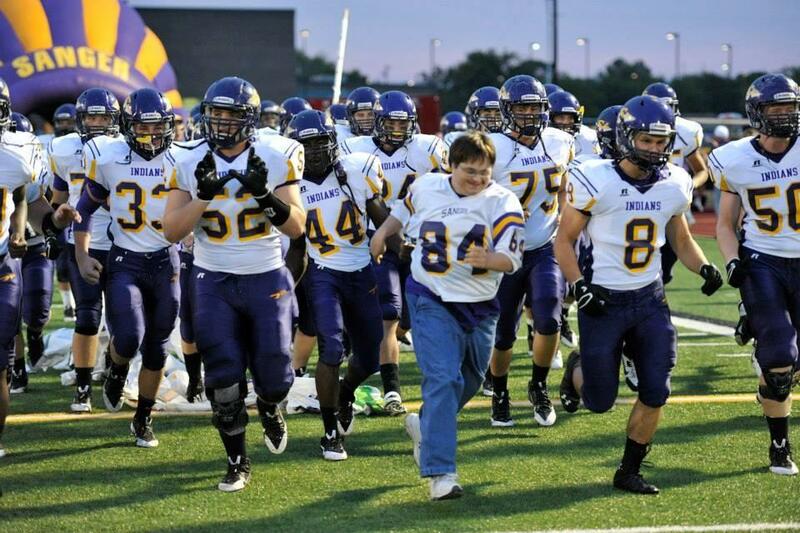 He named not only Blake but another young student with Down syndrome, Austin Waters, as Honorary Team Captains. “They’re an inspiration for all of us. I know for me, specifically,” the coach told the media in the video below. “Whenever I talk to other moms, I tell them to be involved. All moms should be involved with their kids lives, but moms of kids with special needs have to do double time,” Mary Ann said. 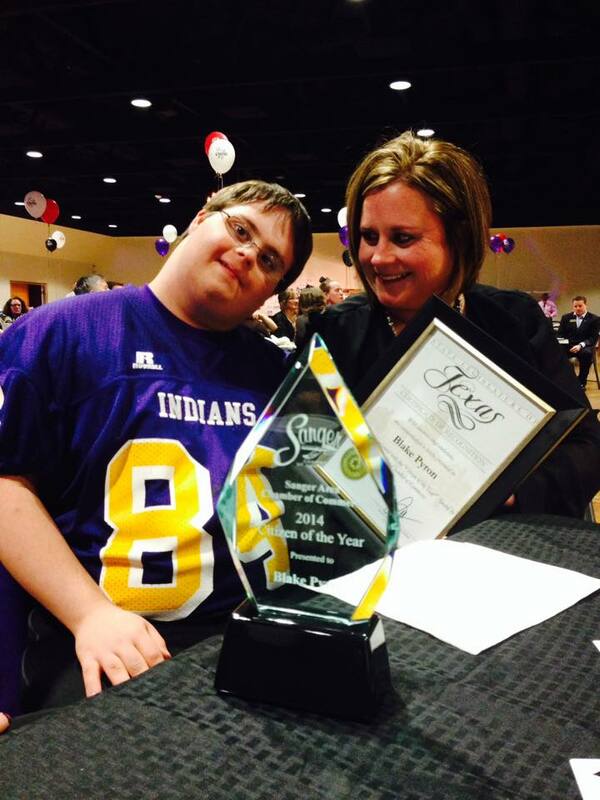 She told Live Action News that as a result of the way Blake brought the community together around football, he was granted Sanger’s Citizen of the Year award in 2015. Pastor Mann said that family, church and community are key to coming alongside any family who has a child with special needs. New Life Church embraces all kinds of people, he said, pointing out that he has several families in his congregation who have disabilities or children with special needs. “When you have a church and an entire town behind you, it makes it a lot better,” he said. Live Action News asked these three how other communities could embrace people with Down syndrome just like Sanger has. 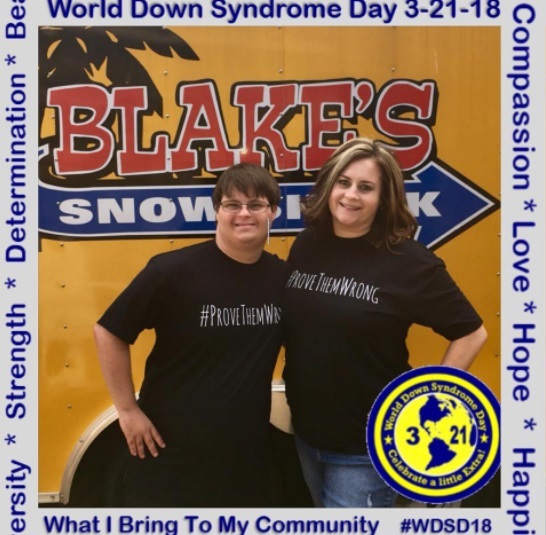 Special Note: Wednesday, March 21st is World Down Syndrome Day (WDSD) and Blake, as one of 12 speakers across the globe, has been invited to speak on Disability Employment at the United Nations Headquarters. Blake is expected to speak about the benefits and struggles of owning his own business, the reach of families that come to see him, and the impact his business has had within the community. The following day, on March 22, 2018, Blake will ring the NASDAQ opening bell at 8:30 am CT. Blake may be one of the first men with Down syndrome to to this. 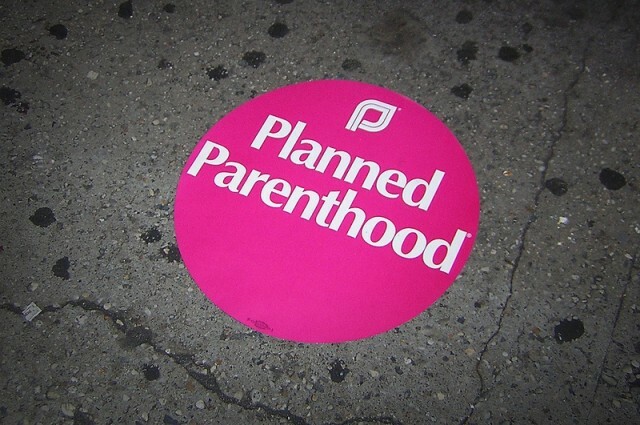 No, the sky won’t fall if Planned Parenthood is defunded. Here’s why. If you listen to the pundits who support Planned Parenthood, the sky will surely fall if the abortion chain is defunded. If even one Planned Parenthood affiliate or center has to close as a result of defunding, they say, the patients Planned Parenthood serves will have no access to health services elsewhere. This is utter nonsense, of course. The claim that removing federal dollars from Planned Parenthood will shutter their doors is ludicrous. As Live Action News has previously reported, the organization’s own annual reports reveal that Planned Parenthood has been netting a profit for many years. Almost every year since 2000, Planned Parenthood’s revenue has exceeded their expenses — not just by a few dollars, but by tens of millions of dollars (yearly surpluses of $12.2 million in 2001 to a high of $155.5 million in 2010). In addition, with the threat of defunding now more real under the newly elected Congress and president, Planned Parenthood has repeatedly claimed that private donations are suddenly flooding into their coffers. For the sake of argument, let’s imagine what would happen if we applied this same logic — that a profitable organization should be taxpayer funded, merely because closing would disenfranchise its customers — to any other business. Let’s suppose it was thought that department store chains should receive taxpayer funding because online sales are hurting chain stores’ business. The argument could be made that these department stores have served many people, that they are located in many disadvantaged communities, and that poor people who do not have internet access will be disenfranchised if these stores close. Should we then give these stores half a billion taxpayer dollars every year (the amount Planned Parenthood receives) to keep them open? The truth is that there are Federally Qualified Health Centers (FQHC) already in place, which could serve the patients Planned Parenthood serves — outnumbering Planned Parenthood centers by the thousands (a 20 to 1 margin)– so why do Planned Parenthood spokespersons (many who earn six-figure salaries) want you to believe that American women could not survive without them? This is literally whether a young man in Texas can come to us for an STI testing, or whether a woman who has a lump in her breast can come to us in Ohio to have a breast exam or be referred for screenings, or whether a college student or a young person anywhere in the country can come to us for family planning. We’re talking about more than a million-and-a-half people who rely on Planned Parenthood, and for most of them we’re their only medical provider. As all of the medical institutions have said: There’s no one to take our place providing low- and moderate-income people with preventive health care. There isn’t any other entity that is doing that work. Interesting that she mentions the breast screenings, because Planned Parenthood, as Live Action has documented, does not do mammograms — but FQHCs do. I am curious, however, as to how the defunding of Planned Parenthood would cause the apocalypse, but closures of other non-profits — specifically hospitals, which one could argue offer far more needed “services” — would not. Researchers reported that among Medicare patients there were no substantial changes in admissions, lengths of stay, or readmissions, but also cautioned that the study should not be interpreted to mean that every hospital loss is harmless…. While the study supports the argument that access to care has improved, the data does not, however, tell the whole story. One-third of institutions that were closed were “safety net” hospitals that treated large numbers of low-income and uninsured people. Since only easily-accessed Medicare patient information was reviewed, impact on those populations is still unknown. A photo of the clinics that outnumber Planned Parenthood 20 to 1. FQHCs are required to provide primary, preventive, and emergency health services. FQHCs focus on providing more comprehensive primary care, dental, and behavioral health services. FQHCs provide far more services in a given year than do PPAHCs. PPAHCs focus their services on individuals of reproductive age; FQHCs provide services to individuals throughout their lifetimes. FQHCs served 22.9 million people in 2014; PPAHCs served 2.7 million. 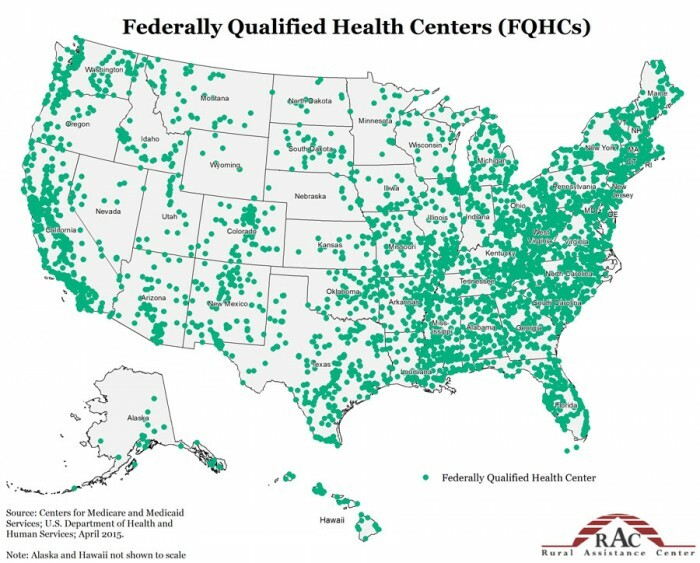 358 counties have both a PPAHC and a FQHC. FQHCs also receive federal grants that require them to provide family planning (among other services) to Medicaid beneficiaries. For years, Planned Parenthood has been closing centers despite a steady increase in funding under the Obama administration. The Congressional Research Service found that the number of PPHAC affiliates and facilities has declined since 2009-2010, when PPFA reported having 88 affiliates (a 32 percent decline) and 840 health centers (a 21 percent decline). 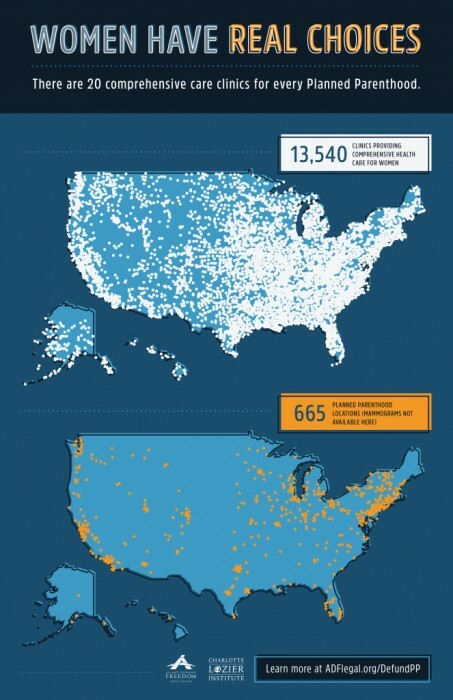 And, as of December 20, 2016, there are now only 650 Planned Parenthood centers, indicating a 22.67 percent decline. In addition, Planned Parenthood patients have also decreased over the years. In 2014, Planned Parenthood saw 2.5 million patients — down a whopping 24.24 percent since 1996, when they saw 3.3 million and received far less government funding ($177.5 million in 1996 compared to $553.7 million in 2014). In contrast, FQHCs have increased the number of patients seen in each year since 2009. From 2009 to 2014, FQHC patients increased from 18.9 million to 22.9 million. Planned Parenthood is the largest provider of abortion in the nation. Live Action has documented how Planned Parenthood manipulates its own data to cover up the fact that abortion – not women’s health care – accounts for the lion’s share of the corporation’s services for pregnant women. Defunding the largest chain of abortion clinics will not send millions of patients to their demise — and Planned Parenthood knows this. The truth is that taxpayer dollars can be better spent on real health care organizations that will serve the American public and maintain the sanctity of life in the process. While we await the decision from the Supreme Court in a case that challenged a pro-life law which forced the closure of several substandard abortion clinics in Texas, hundreds of Texas women have learned that they will have to travel further for obstetrical care after the closing of an OB unit in the state. The news will affect workers who are now slated to lose their jobs, and yet the media is relatively silent. Texas Health Presbyterian has announced that it will close its labor and delivery unit at its Kaufman hospital and even though it will negatively affect women’s health in the state, there is little outrage. Flashback only a few years ago after when closing of several abortion facilities in Texas following sweeping pro-life legislation, caused an uproar and constant drum beat of outrage from pro-abortion women’s groups and the news media. But, alas, this unit is helping babies be born and not taking their lives. Texas Presbyterian claims that there has been a decline in the number of women seeking their services and that is what has prompted their decision to close the Kaufman OB unit in May. But, less than a year after an Obstetrics Unit in another Texas city, Denton closed, a neighboring hospital said they noticed a huge increase in deliveries. In Kaufman, the closure will force pregnant women to drive potentially long distances. The limited remaining options for care are at least 40 miles away, putting women and their babies at greater risk. The closure is also ending the practice of the city’s only OB doctor. Despite hospital officials claiming this long distance will give women ample time to arrive at another obstetrics unit, a hospital nurse who spoke to Fox4 in Dallas said this will not help the women who have typically walked through the doors to deliver within minutes of their arrival. Even though the hospital says it will accept women into their Emergency Room, the nurse, who pointed out that the closure will affect mostly “lower socio-economic” women, claimed that no one will be available to do an emergency C-section. The hospital responded by noting that in cases of emergencies, the women would have to be transported by ambulance the 40 miles to Dallas. Since HB2’s passage, abortion enthusiasts have crawled out of the woodwork to decry the closures as a direct attack on their “right to abortion.” The media has been swift to measure the distance a woman might have to travel if their otherwise unfit abortion clinic were to close down. They predicted dire health consequences from the closures, none of which have materialized in the state. Yet, in light of the Texas OB unit closing, I hear only crickets when it comes to – oh- say “A woman’s right to a safe and simple delivery.” And, believe it or not, this is not a new phenomenon women are facing in the state or the nation for that matter [still hearing crickets?]. According to ACOG, “Rural America” is home to 22.8% of U.S. women aged 18 years and older. Each year, about 500,000 women in the United States give birth in rural hospitals, yet easy access to labor and delivery units has been declining. A spokesperson for the Texas Presbyterian Hospital told Fox4 that many rural hospitals have closed their OB Unites in past years. This includes Ennis Regional Medical Center which discontinued obstetrics services in 2016. 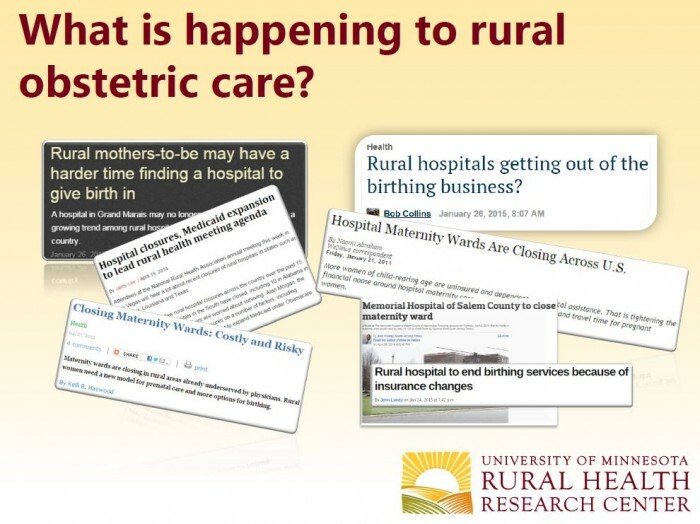 According to a report, published in 2007 by the The Walsh Center for Rural Health Analysis, entitled Why Are Fewer Hospitals in the Delivery Business?, from 1985 to 2000, the number of hospitals that provided obstetric services dropped by 23%. As a result, more than one-third of counties in the US lacked hospital-based obstetric services in 2000, significantly more than the one-fifth of counties without hospital-based obstetric services in 1985. These units were smaller in size, more likely to be privately owned, and located in communities with lower family income, fewer obstetricians, and fewer family physicians. Prenatal care was still available in 17 of 19 communities, but local women would need to travel an average of 29 additional miles to access intrapartum care. “The fact that closures continue happening — over time that means the nearest hospital gets farther and farther away,” Katy Kozhimannil, who co-authored the analysis told Kaiser Health News. 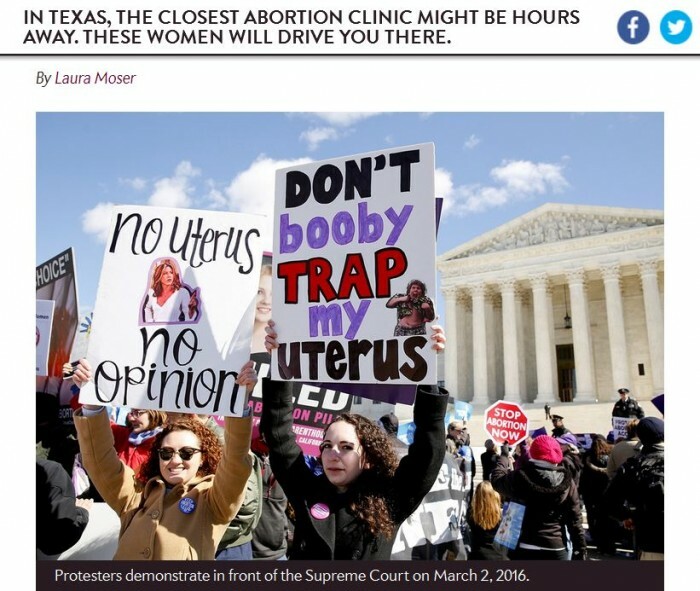 The disconnect between accessing obstetric services versus abortion services for women in the state Texas as well nationwide is glaring. It reveals that the majority of abortion defenders are more concerned about whether low-income and/or rural women access abortion rather than having access to a place where they can safely give birth. This displaced focus also reveals that the media is lax in reporting the full story of what is happening in Texas. And, while we await the Supreme Court’s decision on the Texas pro-life law, one thing is certain, the circus around abortion will continue while more obstetrics units close down. The owner of a Texas snow cone business is showing the world what Down Syndrome people can accomplish. 20 year-old Blake Pyron is the youngest person in his city to become a business owner. Blake is like every other young man. He has a girlfriend and he wants to earn his own money to take her to the movies. What makes Blake unique is that he has Down Syndrome. Blake is also the first Down Syndrome business owner in his hometown of Sanger and possibly in the whole state of Texas. Blake was born to Mary Ann and Billy Pyron in 1996. Mary Ann told Live Action News that she was asked by her doctor to have an amniocentesis, but she refused. The couple had vowed to accept any child the Lord gave them, “We didn’t take it because we knew we would never have an abortion,” she said. Mary Ann, was also born in Sanger and she said that she had never really heard about Downs before Blake’s birth. She detailed a gloomy prognosis for her son which was given to her family from medical personnel who she said gave her no hope. Her biggest fear was that Blake was going to die. As Live Action News has previously reported, women who are told their preborn child has Down syndrome are often pressured into an abortion, something disability advocates call a horrible and violent form of discrimination. A 2012 academic review of published literature on abortion after a prenatal diagnosis of Down syndrome in the United States found that more than half of preborn children with Down syndrome are aborted. Nine hospital-based studies showed the rate of abortion to be as high as 85% when a preborn child is diagnosed with Down syndrome. The prognosis the Pyron family received was bleak, but, Mary Ann said she and her husband refused to believe that report. “In the hospital they were like, ‘Well, he might be able to walk, he might be able to talk,‘” Mary Ann recalled. “They didn’t give us much hope for Blake’s plans. But we had faith,” she told WFAA a local Dallas news outlet. “We always knew in our heart that this wasn’t the truth – that God has a plan for Blake.” And Mary Ann was right. Blake far superseded the doctor’s predictions and went on to become a football captain, the prom king, citizen of the year for Sanger, DFW super Star, and has been in a country music video. “Blake is removing boundaries for these kids,” his mother said. Part of God’s plan is Blake’s Snow Shack which has opened a door for Blake and his family to tell their story. In October, Blake applied for a permit for the business. He then appeared before the City Council. Mary Ann reports that as God would have it, the approval letter for Blake’s Snow Shack arrived 20 years to the date when she and her husband said they received Blake’s diagnosis. Blake’s Snow Shack will open in April. After hearing Blake’s story, a Dallas Ad agency reached out to the Pyrons and has committed to helping Blake with his grand opening which will take place May 7, 2016. In advance of the opening, supporters of Blake and his business venture can place orders for a Blake’s Snow Shack T-shirt on his Facebook page here. For Mary Ann it has never been about a snow cone business, for her it is about the babies and how Blake’s story will help mothers of these children understand how full their lives are, “Our lives are so rich because of Blake, I couldn’t imagine life without him,” Mary Ann said. Mary Ann said that Blake’s story has been picked up by a number of major media outlets and as a result she has been contacted from mothers as far away as Europe. Mary Ann said that because of Blake’s story, she has counseled many mothers who have received a report of Downs. 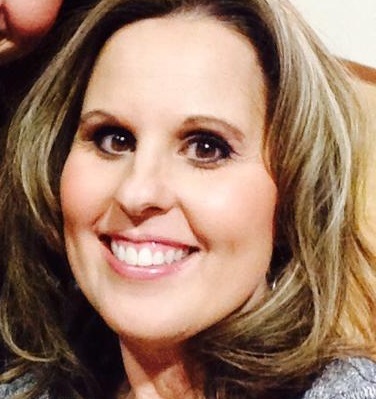 She wants any mother who is given this diagnosis to feel free to reach out to her and has given Live Action News permission to publish an e-mail address where she can be reached. That address is maryannpyron@hotmail.com. Christmas is often a time of joy and laughter but for many this week disastrous storms turned the holiday into a season of tears. Among several heart wrenching stories, one that involved the love of a caring father emerged after his newborn baby girl became one of the 11 victims killed during Christmas weekend’s deadly outbreak of devastating tornadoes in North Texas. The baby’s father, injured and bleeding, had one request for his neighbor – to take his baby to the hospital. In a hard hit area just north of Dallas, a rural Collin county family gathered to celebrate the arrival of their newborn baby girl just days earlier. Jose Daniel Santillano along with his wife Zuleyma and 4 children were among many families whose peaceful day after Christmas was suddenly ended by a tornado throwing their mobile home approximately a hundred feet from where it originally stood. Neighbor, Debralee King explained to CBSDFW what happened just after the storm passed as she saw the baby’s father running toward her carrying the newborn lovingly in his arms. “At first I didn’t realize what was going on,” she said. “I thought they were glad the storm was over.” King explained, she heard the baby’s father beg her to take his little daughter to the hospital immediately. “It’s like he trusted me with her,” King told an NBC Dallas affilliate. “He wanted me to take her to the hospital. He was frantic. His wife was still trapped at the end of the house inside. He was running across the road with his baby saying, ‘Please help me, take her to the hospital.’ He was hysterical,” she said. King was stunned at first, that the man would hand his child over to her, but the loving father had other family members he needed to rescue and he knew his daughter needed help. To most people like myself who watched the devastation unfold as we sat just miles from danger, the loving and trusting response of this father was overwhelming. The emotional story of Jose Daniel Santillano swept through the Texas news sites, but, tragically, the news was not good. Although the baby’s father and mother both suffered injuries and needed to be hospitalized, and their three other children made it out without harm, their 2-day-old newborn identified later as Aeleyah Santillano did not survive. “I was holding her little fingers, When they’re little they like to curl their little fingers around you. Her little hand was cold…I kept saying please baby, please baby be okay I did the best I could but now begin to think it wasn’t enough it’s just haunting,” King said. Captain Jim Moody of the Collin County sheriff’s department said that it was unclear whether Aleya Santillano died in the tornado or had briefly survived but the family was devastated with their loss. According to reports, a Blue Ridge church has volunteered to let the Santillanos stay in an empty parsonage while they recover. 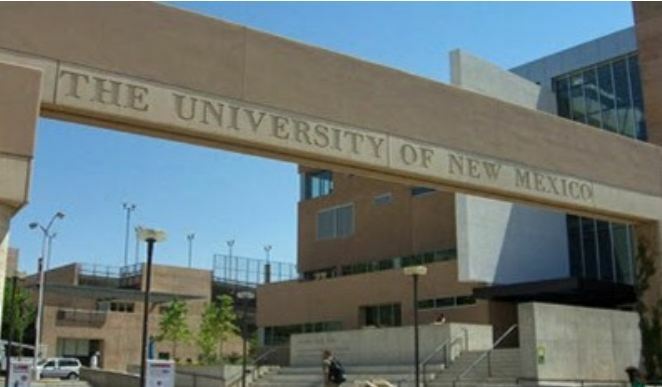 A New Mexico University has halted a training program using doctors from a late term abortion clinic which provides the University with fetal tissue for research. 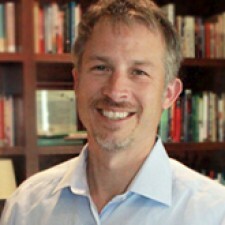 The Albuquerque Journal newspaper has reported that the University of New Mexico (UNM), which is a publicly-funded institution, has cut ties with Southwestern Women’s Options (SWO), a late-term abortion facility owned by Texas abortionist Curtis Boyd and has been the subject if a previous undercover sting conducted by Live Action. The abortionist is one of a handful of doctors in the country that performs abortions in the third trimester. He claims to be a former Baptist minister and admits that he knows he “is killing.” Southwestern Women’s has a location in Dallas and one in Albuquerque. The documents included copies Southwestern Women’s Options (SWO) informed consent paperwork which every abortion patient must sign indicating that Boyd and (SWO) may be using aborted babies in medical research. Protest ABQ pointed out that New Mexico has a law prohibiting the selling of body parts. But despite the law, UNMH officials admitted to the Journal that they have been accepting fetal tissue from Boyd’s clinic for a decade claiming the abortionist is not paid for the baby body parts. In addition, Dr. Richard Larson, executive vice chancellor and vice chancellor for research at the UNMHSC, the University of New Mexico Health Sciences Center, told the Journal that Boyd’s clinic is the school’s only supplier of fetal tissue. To justify the use of dead children in the late gestational age, Larson told the Journal that the “fetal tissue” they collect from Boyd will, “reduce the mortality of premature babies, especially these extremely premature babies.” Officials also claim that their grisly research will reduce the likelihood of blindness, cognitive defects and other anomalies found in newborns between 24 and 30 weeks, the same age as the babies Boyd kills. In a May 2015 letter to UNMH, the Journal reports that Boyd specified that in abortions of less than 20 weeks, his doctors use “aspiration, dilation and evacuation.” Abortions after 20 weeks involve “feticide” by injecting the fetus with the drug Digoxin, Boyd’s letter states. University officials still find the use of “fetal tissue” acceptable. What they are now publicly distancing themselves from is their training program with Boyd’s clinic and fellow abortionists staff who were described as “faculty” under the training agreements with UNM. 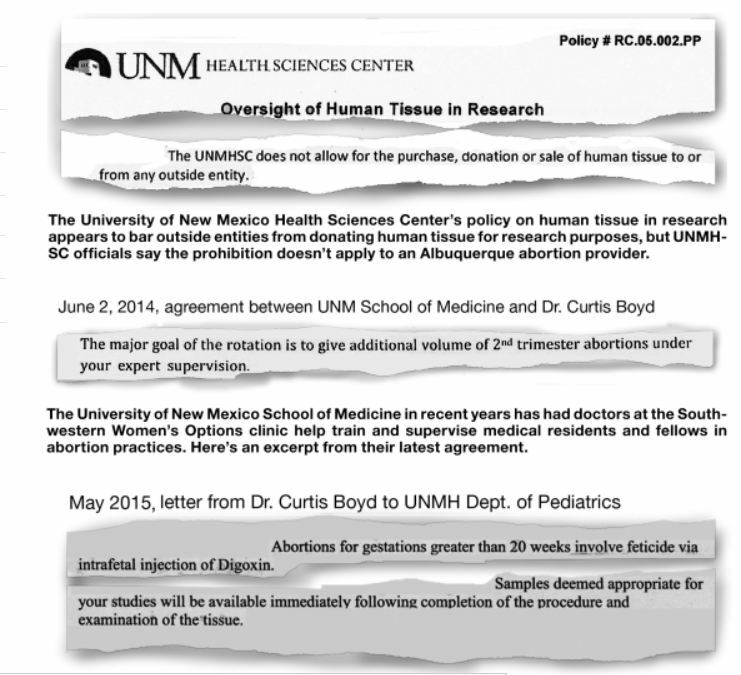 The decision by UNMHSC officials to no longer send medical fellows or residents to Boyd’s clinic, follows a letter from New Mexico state Rep. Rod Montoya and other legislators who questioned top Health Sciences Center officials last July about the relationship with Boyd’s clinic and the use of “body parts” from women who have abortions there, the paper states. Montoya told the Journal that the argument could be made that the residents and fellows were helping the clinic augment its staffing for abortions. “Initially, it had the appearance of being a transaction of sorts,” Montoya said, according to the Journal. “Of staffing in return for the body parts. That’s the appearance, and I informed them, ‘that’s how it appears to me,’ ” adding that he is concerned that there is no oversight of abortion clinics in the state. “We know that the vast majority of New Mexicans believe we should not have a free-for-all when it comes to abortion,” the Representative said. Bud Shaver described the University’s “fetal tissue research” program as unethical and immoral and said that he is now calling for them to cut all ties with the late term abortion doctor, “The University of New Mexico (UNM) has been caught red handed trafficking and using baby body parts for their medical research,” he told Saynsumthn. “This is unethical and immoral which is why Protest ABQ is calling for UNM to cut all ties with Curtis Boyd at Southwestern Women’s Options (SWO) which is their sole provider of baby remains. The fact that the residency training rotation has been stopped at SWO is merely a bandaid on the bigger problem which is UNM’s overall radical abortion agenda which is what Protest ABQ is demanding UNM to halt,” he added. Read the Journal’s report here.